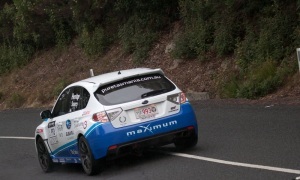 Day 1 of Targa Tasmania 2012 saw the crews tackle the ‘northern loop’, using roads that have been used for many years. However this year the loop was run in the opposite direction, with the 9.5km Quamby Brook stage opening leg 1 rather than completing it. The first two stages were relatively easy runs, with almost all the crews completing them within the target time and, therefore, not incurring any penalty time. It was from TS3, Merseylea, that the real competition began and, as expected, the Lamborghini of Jason White and the Nissan GT-R of Tony Quinn resumed their battle for the lead, Jason White taking first day honours by 13 seconds. 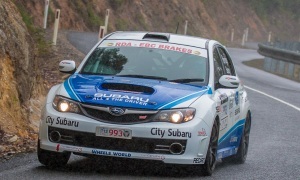 Behind them Dean Herridge in the Maximum Motorsport WRX STI maintained a consistant pace to complete the day in 4th outright, sandwiched between the Mazda of Brendan Reeves and Jim Richards Porsche 911. “We’re actually a little surprised to be 4th”, commented Dean on the way back to Launceston. “Some of the guys around us has minor problems today, and we just tried to run at our own pace. We’re working to our own strategy for the event. There’s a long way to go until Hobart and we want to play to our strengths and not get caught up trying to beat anyone at this stage of the event. So to be 4th, almost 3rd, is a bonus”. Tomorrow the crews head off on the long and tricky ‘eastern loop’, taking in iconic stages such as Elephant Pass, The Sideling and the Longford town stage. This entry was posted on Wednesday, April 18th, 2012 at 6:27 pm.